My sister in law Jan sent me this recipe a couple of weeks ago, saying she had taken a pan of this sweetness to a meeting at work. It disappeared almost immediately. In case you didn’t know, Wheels’ sisters are superb cooks. They got it from their mom! So I didn’t even blink – just made this recipe the next morning. Tweaked it to make a second batch this morning and here you are! Melt the butter for the topping in the microwave. Add the brown sugar and cinnamon. If you are not a fan of cinnamon like we are, you might want to reduce the amount by half a teaspoon. Swirl the mixture through the batter waiting in the pan. Make two swirls, one on each half of the pan. It’s easier to evenly distribute the goodness that way. Jan said she made a double batch and baked it in a 9x 13 pan. You may have to add a few minutes to the baking time to be sure the center is done. Whatever size you choose, the pancake is done when it begins to turn golden brown at the edges and pull away from the sides. While I was tweaking, I also experimented just for you! I made it with the melted butter in the bottom of the pan the first time. The second time I used cooking spray. Both worked well– but the butter added to the flavor and texture. If you melt the butter in the oven as it preheats, check periodically because you don’t want the butter to brown. I forgot the frosting the first time before I tasted it. It was good. But I was determined to follow directions for once so I added frosting even though the pancake had been out of the oven for a few minutes. It was cool enough to allow the frosting to spread well, but warm enough that the frosting melted in. And it elevated the flavor another notch! Definitely need a bit of frosting. The second time I put the frosting on straight out of the oven. It was hard to spread on the hot surface and the sugar swirls pulled into it leaving it messy looking. I’ll update when I do this, but I recommend putting the softened frosting into a zipper plastic sandwich bag, snipping off the corner and drizzling the frosting on instead of spreading. You can control the amount and use less while keeping the flavor. You won’t have to worry about spreadability or messing up the pretty swirls. Plus it’s faster than waiting for the pancake to cool. Important with everyone standing around drooling at the aromas and in anticipation of super yummy! It is, as Wheels said, a sweetness explosion. Serve in moderation. Or not, if you have no worries in that direction. We had a breakfast of scrambled eggs (protein) and fresh fruit and treated this as a dessert for our day off brunch. Bytes hijacked the rest of the pan and poured a giant mug of coffee before disappearing into his office. You could easily make it your whole breakfast as he did. Whatever you do – prepare for knock your socks off good stuff! A special treat swirled with cinnamon and brown sugar, this recipe is quick to assemble and super yummy! Turn oven on to 350 degrees. Place 2 tablespoons of butter in 7x11 inch pan and set in oven to melt as oven preheats. Place remaining pancake ingredients in medium bowl and whisk together until smooth. Pour over melted butter in baking pan. Melt ¼ cup butter for the topping in small microwave safe bowl. Add brown sugar and cinnamon to melted butter. Mix thoroughly. 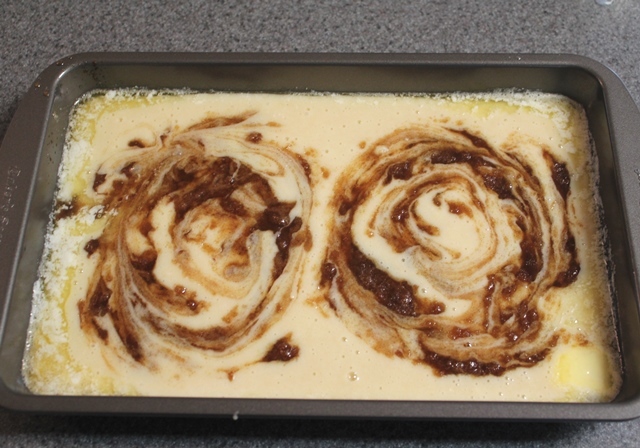 On one end of the batter in the baking pan, make a swirl over one half the batter of the brown sugar mixture. Use a knife or teaspoon to swirl brown sugar into the batter. Repeat for the other half of the batter. You will end up with two swirls. Bake for twenty minutes at 350 degrees until set and golden around the edges. Drop small bits of frosting over the top of the baked pancake and let it cool for about five minutes. Frosting will begin to melt, spread carefully and gently over the top. Shared with these awesome link parties here . I am so glad you stopped by! Follow A Pinch of Joy so you don’t miss a thing! Click the buttons on the header to subscribe by email or RSS feed, follow on facebook or twitter to catch the latest post! If you found this helpful, share on your favorite network by clicking one of the buttons on the bottom of this post. This looks so good! I practically drooled when I saw the end product on my monitor. Thanks so much for sharing with this week’s Throwback Thursday party. I’m pinning this. I really want to try making oven pancakes, but never have. Thanks for sharing at Pinworthy Projects. 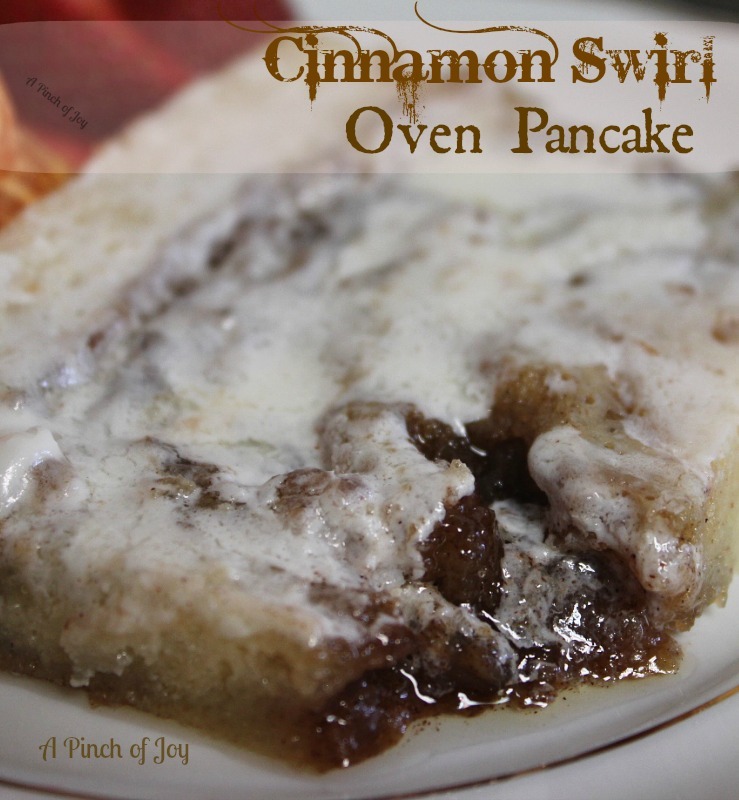 Who wouldn’t just love your Cinnamon Swirl Oven Pancake for Breakfast or Brunch, it looks amazing! Thank you very much for sharing with Full Plate Thursday and have a great week! This looks fabulous and easy – what a great combination! Thanks for sharing. Oh my goodness. I am so making this! It looks delicious and so easy! Thanks for sharing it! This looks so yummy! Bookmarking it so I can make it this weekend. Oh wow you have me drooling! This looks amazing and will be the perfect Sunday meal in our house (which is always a big deal). Oh my gosh- I am drooling!! I have to got to try this soon- I know we’ll love it. Thanks! This looks so good! I love pancakes, but sometimes get sick of standing over the griddle and flipping them. This looks like a great solution! Oh my! What a lovely treat this would make! I’m pinning it to my breakfast board. Thanks.